From heating system repairs, including furnaces and boilers, to replacing your inefficient heating system, contact Comfort Services, Inc. for prompt and professional service. To keep your furnace or boiler running efficiently and prevent expensive repair costs, regular service and maintenance is necessary. We offer comprehensive tune-ups for all heating system makes and models. We provide up-front estimates for heating replacement and new installation services. To request an estimate or schedule a service appointment, call us today! We work in Pinehurst, Southern Pines, Aberdeen and surrounding towns and cities. It’s important to call a professional when you notice a problem with your heating system. Delaying service or repair can result in more expensive damage to your furnace or boiler. From minor fixes, such as replacing a clogged filter, to furnace cleaning, and major mechanical and safety repairs, you can count on our technicians for a thorough evaluation of your heating system and quick, dependable service. No matter what type of heating system you have, it will eventually stop working and will need to be replaced. If your furnace or boiler is old, replacing it can save you money on your energy bill. When it comes to replacing a broken or inefficient system, there are many heating systems to choose from. Our HVAC technicians can help you determine the right system for your home. We provide worry-free pricing and free estimates for boiler and furnace installation and replacement. Contact us today to schedule your annual heating service appointment or get a no-obligation estimate to replace your old heating system. 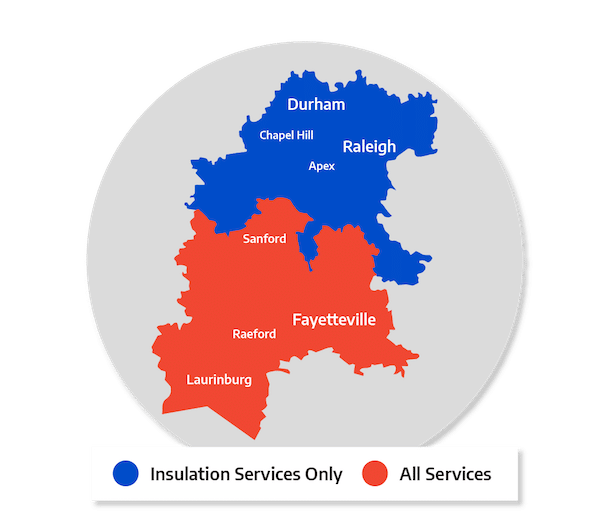 We are the local trusted heating and cooling company serving Apex, Garner, Chapel Hill, Fayetteville, Durham, Fuquay Varina, Fort Bragg and many surrounding areas.